Twilight, the best-selling series by Stephanie Meyers is becoming somewhat of an unpredictable phenomenon. 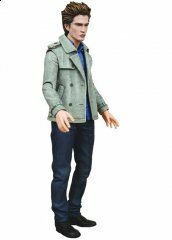 Capitalizing, NECA has produced the first ever Edward Cullen action figure, the stud vampire that will soon set the loins of female fans afire. The figure stands 6 3/4″ tall and features a realistic likeness of actor Robert Pattinson. Articulate and detailed, Cullen will come with a replica of the Cullen family crest.